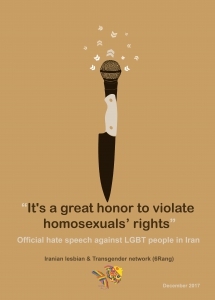 18 December 2017 – A new briefing published by Iranian Lesbian & Transgender Network 6Rang outlines the consistent and widespread use of hate speech against LGBT people in Iran by Iranian officials; including the supreme leader, military officials, Friday prayer leaders, high-level state officials, and state controlled media outlets. The briefing “It’s a great honor to violate homosexuals’ rights”: Official hate speech against LGBT people in Iran’ has monitored the content of newspapers and state controlled media between 2011 and 2017, and provides an overview of the Iranian authorities’ hate speech on homosexuality during these years. The 27-page briefing includes shocking official statements, describing homosexuals and homosexuality on official platforms as “lower than animals”, “savagery”, “subhuman”, “corrupt”, “diseased”, “western” and “Zionist”. These examples are just the tip of the iceberg of a discourse that promotes and justifies hate and violence against LGBT people in the family, society, and in educational, judicial and law enforcement institutions. This briefing asserts that Iranian state officials’ hate speech against LGBT people is a clear violation of international human rights law and standards, specifically the principle of non-discrimination. “This brief shows us where the roots of widespread homophobia among Iranians – as seen in mainstream and social media – lie,” Amin says. In this briefing which has been submitted to relevant international entities, 6Rang urges influential members of the international community to hold the Iranian government accountable for spreading hatred against LGBT people, which is in violation of Iran’s international obligations. 6Rang also urges media, educational institutions, medical professionals and civil society groups in Iran and elsewhere to take up the concerns raised in this report, and mobilize their resources to address stigma, discrimination and stereotypes based on sexual orientation and gender identity and combat attitudes and statements by government officials that promote violence, discrimination and hostility toward LGBT people.